Big L T-shirts and Sweat Shirts! 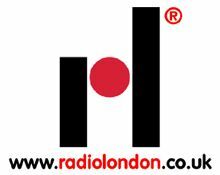 Exclusive Radio London clothing from our on-line store! had been on the net for 20 years. Tune in for everything you ever wanted to know about Radio London  'Big L' 1964 - 67; the station, the DJs and the good ship Galaxy! Caroline Flashbacks! Meet Bud Ballou, Keefers and the whole Caroline Sixties gang, see the 2004 Reunion photos AND the Caroline charts. Tartan radio waves were all the rage in the 60s! In 2004, the Beeb emulated the pirates so well that they did it again in 2007 and 2009! Over 2300 pages on the site! These logos are registered Trade Marks of Radio London Ltd. I want to send my thanks to you both for a really wonderful website. It's been over 10 years of wonderful news of offshore gems. You have both kept the interest of Offshore Radio alive, and it's magical – there is nothing in the whole of this world to beat it. I also believe that Offshore would have died if the website wasn't around with the amount of news items, the hard work behind the scenes and the time that you both put into it. No other site has the same dedication on the same scale as yours. I hope you will keep the site going for many more years to come and I feel you both should be awarded the MBE for keeping Offshore Radio alive on the site and in our hearts. More Tenth Anniversary comments here! "I could not possibly thank you enough for keeping the blood, sweat and tears fresh and alive. Without you, Radio London would merely be an ever-fading, occasional memory." 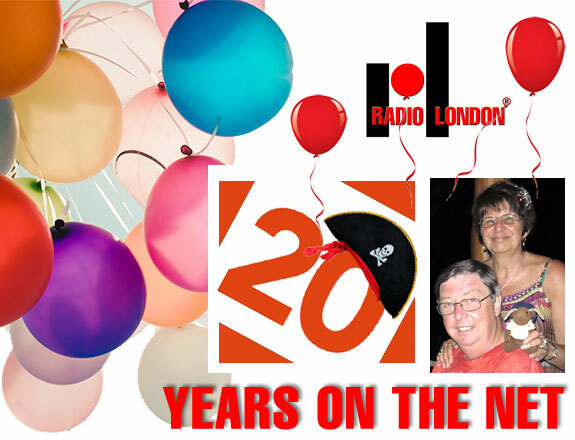 "You have done an outstanding job in keeping the spirit of Radio London alive; I know my father would have been amazed and impressed that something he started over 40 years ago is still being talked about. Thank you, Mary, for all that you do." If you would like to link to us, please read this! Radio London is not responsible for the content of external websites. We would appreciate reports of any broken or out-of-date links to external websites. Radio London Ltd has no connection with Big L Ltd.
Radio London Ltd will not in any way be involved in, nor liable for, negotiations between the seller and purchaser, actual sale, nor quality of third-party merchandise promoted on this website. While we try our very best to abide by copyright laws and those inherent principles, we have noticed that some website creators are linking directly to pictures on our site. We request that you do not do this, as we do not hold the copyright to all the photos on this website and in such circumstances have been granted sole permission for use on our website. Radio London is a participant in the Amazon Europe S.à.r.l. Associates Programme, an affiliate advertising programme designed to provide a means for sites to earn advertising fees by advertising and linking to amazon.co.uk or Javari.co.uk. Some links on this website go directly to products at Amazon.co.uk. We appreciate you using these links to purchase items.